Equestrian Australia wishes to confirm the appointment of the following High Performance Endurance positions for the period including WEG 2014. Congratulations to the new appointees, Equestrian Australia looks forward to working with these people to increase the success of Endurance in Australia and overseas. ESNZ Endurance has named a strong team of four horses and riders to compete in the Junior/Young Rider Endurance World Championship in Abu Dhabi on December 10 this year. This will be the first time for the New Zealand Junior/Young Rider team to send kiwi combinations; in the past the riders have travelled over and ridden lease horses. The four girls bring together a mix of experience and strong ability with all competing at CEI 3* 160km level. ESNZ Endurance has also selected Kevin James as the Chef d’Equipe and Susan Reid as the Coach for this team and event. Last week saw the biggest event on the South African endurance calendar take place: the SA National Championships at Fauresmith in the Free State. It’s a 3 day race over 201km, in freezing, sub-zero conditions, which attracts riders from all over the country as well as overseas. This year a record number of horses were on the starting line… 406! The Eastern Cape Endurance Riding Union entered three teams for the event, and two of their members had the honour of being selected for the ERASA national teams. Top ranked EC rider, Laura Seegers from the Midlands Club, was on the national Standardweight team, and Werner Bosch of the Hofmeyr Club was on the Heavyweight team. Laura – founder of Perseverance Arabian & Endurance Horses in Graaff-Reinet – was riding PSV Jedi in his first Fauresmith, and the two of them flew around the course in 8h36 to take 5th place! She was the first rider for her team to come in, and her fast time helped them take 2nd place. All three of the Eastern Cape’s own teams placed well in their categories: the Young Riders came 3rd, the Young Riders Development Team came 5th and the Standardweight team came 4th. Our Young Riders did particularly well. Jenna Masterson of St Francis placed 6th, Megan King from Graaff-Reinet – on another barefoot horse, Moya, – came 8th and Liezl Botha of Tarkastad 10th; with Ashley Gower from the Perseverance stud coming 17th on PSV Mauser in their first ever Fauresmith. Captain of the Royal Endurance team Shaikh Nasser bin Hamad Al Khalifa today credited His Majesty King Hamad bin Isa Al Khalifa for the outstanding results achieved by the Bahraini riders in the European endurance races, asserting that HM the King’s close follow up and directives have had a great impact on riders and motivated them to bring about more successes so as to reflect the advanced level of endurance sport in the kingdom. « The new achievement testifies to the wise leadership’s keen desire to upgrade the sport movement in the kingdom through providing the necessary support and creating favourable conditions for success in order to raise Bahrain’s position higher at international sport gatherings, » he said. Shaikh Nasser also praised the German media coverage of the races, adding that local media establishments highlighted the Bahraini Royal Endurance team’s superb performance. Marlborough's Heidi Bulfin and her horse Stonelea Sparkling Rose took out a major award at last week's National Endurance and Trail Riding annual meeting and prizegiving in Hamilton. 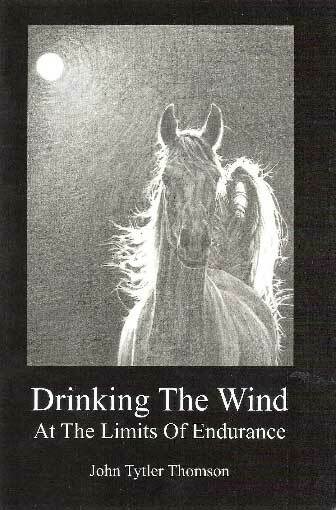 The autobiographical book Drinking the Wind: At the limits of Endurance, by John Tytler Thomson, was released yesterday, July 12, and the Kindle version has been launched worldwide today. Australian animal health officials confirmed Thursday (July 7) that seven horses have now died or been euthanized as a result of contracting hendra virus, according to a report from World News Australia. The most recent confirmed case was located in New South Wales--the second case in that state this year and the furthest south the virus has ever been found. The report indicates that the horse died Sunday (July 3) and laboratory tests confirming the presence of hendra virus in her body were returned yesterday. The farm the horse resided at has been quarantined, and three additional horses living on the property are under observation but aren't currently displaying any signs of illness. * Six people in close contact with the latest fatality bring the total number of exposed humans to 15 in New South Wales and 17 in Queensland. These individuals will undergo "three rounds of tests over several weeks" before they are cleared of being infected with the virus. [Caen, FRANCE] – Laurent Beauvais, chairman of the Basse-Normandie Regional Council and Normandy 2014 Organizing Committee, and Alltech president Dr. Pearse Lyons today announced that Alltech will be the title sponsor of the 2014 FEI World Equestrian Games™ in Normandy. This joint signing represents an historic partnership in the world of equestrian sports with a commitment from Alltech to the value of €10 million. The seventh edition of the FEI World Equestrian Games will officially be known as the Alltech FEI World Equestrian Games Normandy 2014. “Alltech is proud to continue our partnership with the World Equestrian Games,” said Alltech President and Founder Dr. Pearse Lyons. “These world championships of equestrian sport epitomize the values that we applaud: passion, excellence and performance. When the eyes of the world tune in to watch the Alltech FEI World Equestrian Games in Normandy, France, we will be there. Alltech’s sponsorship of equestrian sport brings the brand to life and creates value for our partners, generating strong ties with the end consumer of our products at moments of great passion. France and Normandy in particular, with its worldwide reputation of excellence in horse breeding, is a strategic location for our company. Alltech has a longstanding history of serving the agricultural community in France, and we are thrilled to support the event in Normandy and to share in the pride of this spectacular event. Given the inherent passion the people of Normandy have for the horse, we hope to leverage this sponsorship to support the communities in which we live and work."